This Doulton plate was a wedding gift to my parents who were married in Scotland in 1945. 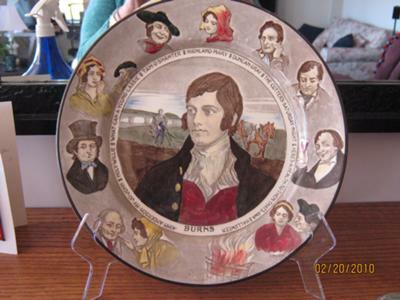 The plate has Rabbie Burns in the centre and features nine of his peotry characters around the rim as well as the names of several well known Rabbie Burns poems. If anyone could help me date this Royal Doulton series ware plate, that would be great. I have a Royal Doulton Robbie Burns plate. It is blue with the same pattern as Anne’s. it has a number on the back which is D339. Can anyone put a date or value to it please? It belonged to my parents so I am not wanting to sell it but would just like some info please. I have one just like this, the Doulton Symbol puts it between 1901 and 1921. However I can’t identify the artists mark,there is no number but the mark looks like a stylised hook in an oval surround. 3 small circles a bar with wavy line through it and a outlined “G” or hook. Has anyone an idea what this might represent? Hi there i also have one of these Doulton plates and mine has a marking on it D6344 on the back of it. Hi your plate appears to be a piece of Doulton Seriesware. The D4746 would place the design around 1928. That’s about as much as I can tell you based on your information and without actually seeing the plate.